Medical Diagnosis and Treatment is a week-long summer program for high school students in grades 9–12. 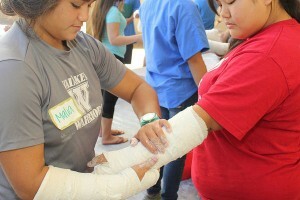 It is an engaging, hands-on learning opportunity for high school students interested in health professions. Students can experience the medical school environment with learning opportunities previously unavailable to anyone other than medical students and physicians. Click to see: Summer 2019 information. Medical Problem Solving is a three-week, half-day summer program for high school students entering grades 11-12. The program provides interactive, hands-on-learning for high school students interested in health professions, using many of the same curricular methods used by medical students. Problem-based learning, lectures, community service, clinical skills laboratories, simulation laboratories with manikins and surgical equipment, and standardized patient experiences are all included. The course is limited to schools with a JABSOM faculty sponsor. These schools are currently Punahou, ʻIolani, Kamehameha, St. Andrew’s Priory and Kaiser, and registration is through the sponsored schools’ summer program. The Minority Health International Research Training (MHIRT) Program is based in the Department of Tropical Medicine, Medical Microbiology & Pharmacology at JABSOM. The program offers exciting opportunities for UH Mānoa students to perform research projects in international locations. The qualifying research projects will be in tropical medicine, infectious diseases and related health sciences. The program spans one academic year, beginning with an eight-day “Introduction to Biomedical Research Workshop” in the summer. Then, students spend about nine weeks conducting mentored research in either Bangkok, Thailand, Yaounde, Cameroon (Central Africa) or India. After returning, students will attend a post-workshop session where they will discuss their summer research experiences in a group setting, work with biostatisticans on data analysis, discuss research results with faculty mentors, and begin preparing written reports. Each participating student receives a stipend of $1,000/month for three months for participating in the summer program.